Firstly, this was an issueless election. Please, nobody won on any issue. You cannot invent issues after the fact. There is understandable elation at the Congress camp. I respect those who cheer the fact that Advani led BJP lost, at least they are honest about it. Then there are the social justice (the no data version) champions. They too are happy, the same way crooks are happy after a heist. Well, everyone arrives at the party with their own bottle of booze. No hard feelings. Personally, I am not too disappointed. I think the current winning combination is better than the last. The BJP has not expanded its base, which must worry them. They have nowhere to recoup losses in their base states. The Congress simply swallowed up the Left and Fourth Front. I have said that the left will die out in West Bengal simply because the Muslims will desert it, thanks to the Sachar report. The communists do have a narrow window to attach the poor bengali muslims to quota benefits, but they do not seem to get it. Mulayam simply forgot to take care of the narrow interest in his custody and paid the price. The Congress is sure to choke the country and further pursue its divisive agenda. Gasp ! If I were on TV now, the anchors would have turned red. Divisive agenda based on caste is apparently not only kosher but necessary. 1. It lets others define it. This is a recipe for political disaster. I remember the political commentator John Carville years ago in the US repeatedly stress this point. In interview after interview, the BJP guests let the words like “communal force” go by unchallenged even while being aware of the connotations. 2. It does not define itself. If the BJP is for Hindu rights, where was it in Malaysia or Sri Lanka ? It did not make a big deal about the Spectrum scam (which I think is a hidden factor in this election). Either it did some adjustments on the scam or was unable to make an issue out of it. Both scenarios are disturbing. Still its work on the Ram Sethu is appreciated. 3. The quota issue completely caught the BJP by surprise. It went along with the Congress. No one can beat the Congress unless it changes the terrain in which social justice wars happen in this country. It was unable to explain the Kandhamal happenings in terms of the quota system, which was its root cause. It did not realize that the middle class is orthogonal to backwardness. The quota system permanently gifted a large chunk of middle class voters to the Congress. Try holding a poll among Delhi University students and families if you want to see the impact of the quota system. I still support the BJP because it still presents the best challenge to the Congress. I can never reconcile with the Congress party’s policies which are nothing but naked corruption and greed with presentable facades such as social justice and concern for the poor. We have had this for decades now. While the world has marched forward we still live largely in filth and misery. This version of socialism and truth do not go together. The BJP should do some serious introspection. Can hindu-anything work in a caste based polity ? It can grow only by undermining caste as the staging unit. The left is on its death bed. You do not make friendship with the Congress for five years and not expect to lose in a direct fight. In the entire five years they were in the media limelight, they never made it clear exactly how they were different from the Congress. The muslim vote in Bengal may never return due to the Sachar report. The DMK pulls off a surprise victory. The more the AIADMK Is out of power, the more vote marshals will desert it. This is a vicious cycle already turned two spirals down. The party may not survive another couple of defeats. Expect more social engineering based on caste, which is sure to dilute the BJP even further. I hope Rahul is made the PM and not Manmohan Singh. However, it does not matter much this time though because the Congress will have almost complete control of the new government. I was watching Rajdeep with curiosity as he sought to project this as a PHOTO FINISH. Far from being a photo finish, this implies an easy win. Remember that the left and the SP/RJD/LJP will come back to the UPA automatically. The number then will be 200 + 40 + 35 = UPA is back. I was completely surprised none of the panelists called him on that. This was a classic. With 198, Times Now was essentially predicting the NDAs defeat. Mr Chandan Mitra squirmed and Mr Scindia gleefully called the anchor Arnabh Goshwami on it. 1. All predictions discount the LJP/SP/RJD/Left. If they are taken into account and Trinamul deducted, then all Indian media channels are infact predicting an easy UPA win. There is no need for the Congress to rope in Nitish Kumar, play tricks with Jayalalitha, or dance with Patnaik. 2. No channel I watched gave state wise breakups. This is shocking and calls into question the quality of these numbers. 3. The polls assume a Congress / NCP sweep in Maharashtra. If this happens, the NDA can sit in the opposition. 4. The polls do not include the last phase, but guesses were made instead. For TN, the guess was the AIADMK will sweep. This could improve the UPAs chances further whichever way you look at it. Remember the Congress holds the cards in Chennai. 5. Congress is predicted to do very well in the urban areas this time. Most panelists were weakly offering ‘good governance’ as an explanation. Reality Check thinks the reason is very simple, the educated urban middle class responds better to exclusive benefits. the UPA is coming back. the NDA is coming back. The media has to call right on THREE things for the UPA to come back , but wrong on only ONE thing for the NDA to come back. So I watched the massive show of strength rally by the NDA in Ludhiana on TV Sunday. It was suprising and somewhat heartening to hear Modi raise the Sri Lankan Tamils issue for the first time. I only wish the BJP had done this earlier. The SL Tamil issue ought to have been formulated as a hindu issue, which it really is. Unfortunately, the SL tamils and their leadership fell for the Tamil Inam (Tamil race) line. This was gleefully welcomed by the political formations in Tamilnadu who have made a fortune out of this Tamil race business. As long as no work needed to be done, everything was humming along. A poem here and a poster there. When words fell short and action was required, the Tamil race line fell apart. There is no doubting the buddhist religious fervor that drives the Sinhala troops. The bikkus have a key role in this military offensive. The misguided application of the dravidian movements principles to areas unrelated to “social justice without data” was bound to fail. For example, there were no protests of any kind in dravidian states like Karnataka, AP, and Kerala. Once a dravidian colour was assigned to the SL Tamils fight, the public landscape in TN was split along predictable lines. So called Aryan (Brahmin caste) personalities like Cho, S. Swamy, N. Ram were forced to align against Eelam. How can they support a armed version of the Dravidian movement ? How can they be expected to support an army who sympathized with the same racial compensatory policies they were accusing the Sinhalese race of ? It was of course tragic that none of these “Brahmin” opinion makers could ignore and laugh at the obvious limitations of the dravidian line and focus on the SL Tamils. When the same issue was dressed up as “the temple destroying Sinhalese ravaging the SL Tamil hindus”, most would stand up in support. This suited both sides of the cleave, the brahmin opinion makers were given disproportionate importance and the dravidian parties went : “We told you about these guys. See there is still work to be done, these guys are against the Tamil race”. Again, no one actually needed to do any work militarily or politically. As long as words and gimmickry like a few hours of not eating was sufficient, things were humming along. A safe and fashionable opinion to hold was this: “we support the SL Tamils but not the LTTE”. In fact, even now we are being sold this line by the media. At the time such opinions were voiced, the LTTE controlled the SL Tamils lives and territory. This was de facto- whether we liked it or not. The Indian governments refusal to accept the LTTEs control was bound to have tragic consequences. It is like saying,”we like the Indian people but not its army, navy, police, courts, civil administration, and media“. India, under the Congress led UPA government has failed the Tamil people in SL, and reduced Indias standing even among SAARC countries. The Hindu leadership , specificially the VHP has a lot of answering to do. Where are they at this critical juncture ? Barring Sri Sri Ravishankar – no one has shown the fervor they reserve for the Pakistanis and Muslims. Even before the SL advance on Kilinochchi, after the fall of the east, the writing was on the wall was clear to all observers. The LTTE were in no position to hold territory. Instead of banning the LTTE, the Indian leadership should have tried to talk sense into them. If that did not work, they should have entwined themselves more closely with the SL offensive. I am not saying this was easy, but it could be done while keeping the Chinese and Pakistanis out. The objective should have been that at this juncture in the military offense, the Indians should have been in a vantage position. Again this calls for too much work for a larger interest, and too little gains from it. A Sri Lankan health official says the civilian death toll from a massive artillery barrage overnight in the island’s northern war zone has risen to 378. V. Shanmugarajah, a physician working in the war zone says the bodies of 378 people had been brought to the makeshift hospital that he runs by Sunday afternoon. He says 1,122 more people have been wounded. Over 100 children killed in weekend bloodbath. More than 100 children were among a large number of Tamil civilians killed in a weekend “bloodbath” in Sri Lanka, the United Nations’ spokesman in Colombo, Gordon Weiss, said Monday. According to medical sources in Vanni, the 2,000 civilians include a large number of women and children. It is also claimed that the Sri Lankan army has resorted to weapons like internationally banned cluster shells. Walsh said on Saturday that he believed the arrests were connected to his recent report on the conditions of war refugees and alleged sexual abuse in camps for those who have fled the war zone. ITN News, which produces Channel 4, said their original report – broadcast on May 5 – contained the first independently filmed video from one of the displacement camps in the north of the island . Does this sound like the death march ? Please read this article in full to understand. Are you shocked at the lackluster response of the Congress led UPA government ? The assault started on the same day that the Sri Lankan government ordered the tens of thousands of civilians still trapped by the fighting to move into an area that is just 2km long and 1.5km wide to enable it to flush out the remaining Tamil rebels. 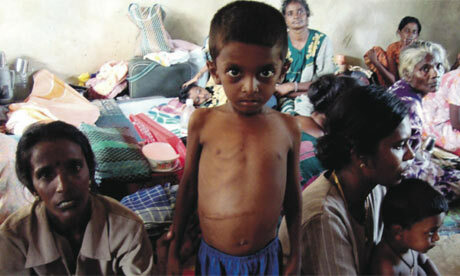 The Sri Lankan government has repeatedly denied using heavy weapons against civilians inside the zone. Last month, it said its forces would use only small arms in their pursuit of the LTTE. However, reports from medical staff, supported by pictures and videos apparently showing explosions and large-scale casualties, have contradicted those claims. A report from Human Rights Watch yesterday accused the government of hitting hospitals with air and artillery attacks. The Quattrochchi case is an embarrassment for the government of India. We have tried to extradite him from Malaysia, from Argentina, and the courts have said we don’t have a strong case. That is a pretty strong statement of support and admission of remorse from a head of state. 1. There is no way Quattrochchi can even get a traffic ticket now. The Prime Minister of India has called his case an embarrassment. 2. The Prime Minister of India has admitted ‘harassment’ of Quattrochchi. Will the former fugitive claim damages now ? It is fully within the realm of possibility. If this whole saga was a mere harassment as Mr Singh, the Prime Minister of India states, then this is serious. We have ruined the life of an innocent man based on an embarrassment of a case. For 18 years. If the above post bothers you, shake it out at the polling booth. You must choose among the evils before you. There is nothing to be ashamed of. This is how the system is supposed to work.